It’s A Billboard Now! Where will my portraits turn up next? Back in the spring I had the joy of capturing a great promotional image for Terri and Laura – a mother & daughter real estate sales team. A house that they had totally renewed was a super setting for their portrait. 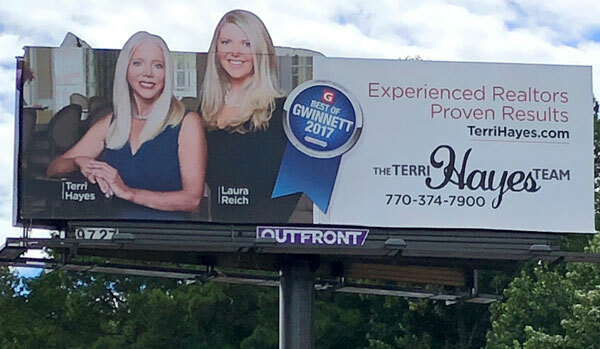 They’ve used in several places – like Gwinnett Magazine’s “Best Of Gwinnett” issue – and recently the image went up over PIB on a billboard. I stopped Saturday as I passed that way to grab a picture of the picture. It’s always fun seeing where my corporate image portraits might turn up next. Give me a call if you have a need for a great image for your business publicity. I’m just as “at home” working at your location as I am in our studio. The portable lighting sets allow me to use great lighting appropriate to each situation. Lawrenceville, Snellville, Suwanee – anywhere in Gwinnett or even the world – I’m ready to go! Business portraits, headshots and editorial portraits are my specialty.